What a difference a week makes. Hard to believe that, less than a week ago, a decorated Christmas tree stood in our house and paper snowflakes dangled from light fixtures. All that is gone now, with the weight of the old year (and aren’t we glad?). With weekend temperatures in the 50s here, it seems like Spring has thrown aside the old year in her rush for center stage. I even heard a frog singing last night. My sympathy to those of you suffering freezing temperatures and snow, but it’s not often we get to gloat about being warmer than Florida. The hummingbirds continue to come and go (they may even talk of Michelangelo), and I’m getting a brief respite before the beginning of radiation next week. 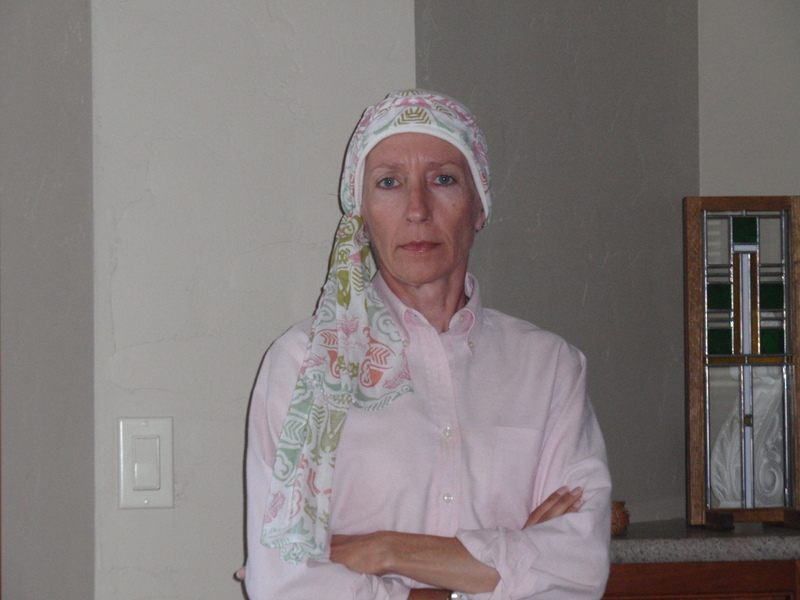 The effects of chemotherapy are slowly dissipating and my energy seems to be increasing. No cell counts, no popsicle report, and still not much hair. (A few more inches of this gray fluff that’s coming in and my daughter says she’ll loan me her hair gel to spike it.) But I have found that green tea is the next best thing to dexamethasone. Last week I checked in with the naturopath, who’s changed the plan now that chemotherapy is over and radiation is about to begin. I get to quit the glutamine and the probiotic, and need to stop the CoQ10 during radiation, since it’s an antioxidant that might interfere with treatment. That leaves only the fish oil and vitamins B and D. He was happy to see that I’ve porked up to 103 pounds. Must have been those gingerbread cookies my sister makes for Christmas. And those cornflake wreaths….. Though time is passing at its usual rate (more and more quickly the older I get), I’m surprised by how quickly the mind refocuses once an unpleasant (but necessary) series of events ends. For six months I trekked to the infusion center every week to spend several hours in a chair. Twenty-four times in and out of the parking lot, in and out of the Barcalounger, jabbed by needles and given poison. The last infusion was less than 2 weeks ago, but it seems months already. I realized the drastic shift in focus yesterday when I went in for a mammogram. Walking into the radiology office jerked me back into hard reality. It was early June when my visits there began the treadmill I’m on. The mammogram served two purposes — the 6-month follow-up after surgery, and to document the new baseline image that the radiation oncologist needs to lay her plan. Once again, I stood by the technician as she pulled up the images on her screen — beautiful rounded shapes of wispy white on a dark background. Hard to imagine there could be anything lethal hiding in there. She compared them with the images from last summer, with the dark spot and cluster of calcifications that signaled trouble. I spoke with the radiologist who reviewed the images. He assures me everything looks OK now. But you know I can’t trust that conclusion. We talked about the recent controversy regarding mammograms, and he readily admitted that mammograms are a poor tool, but as we all know, “it’s the best we’ve got.” And there’s nothing else in the works to replace it. Just to be safe, he recommends following through on the order written after surgery for a follow-up MRI, so I’m waiting to hear back from the radiation oncologist about getting that scheduled. If you look past the provocative lead photo, there’s actually solid information here. The article ends with a link to the Army of Women, a group established by Dr. Susan Love, whom I’ve mentioned before. The link takes you to the Army’s site, where you can sign up to be notified of clinical trials to participate in. You don’t have to have cancer to sign up. They’re doing research on women without the disease to try to find what causes breast cancer. One of the difficulties of doing research for any disease is getting people to enroll in trials. Speaking of other diseases, while at the grocery store checkout over the weekend, I noticed a plastic donation box on the counter. Small, undistinguished, a clear box with a blue label indicating that it was for lung cancer. How very different it was from all the signs, labels, and products we see that are linked to breast cancer, with their bright pink labels and bold lettering. Breast cancer gets a whole month of attention in October. But according to the Mayo Clinic, “Lung cancer is the leading cause of cancer deaths in the United States, among both men and women. Lung cancer claims more lives each year than colon, prostate, ovarian, lymph and breast cancers combined.” The CDC gives these numbers: “In 2005, 90,139 men and 69,078 women in the United States died of lung cancer.” Do the math and you arrive at this total: 159,217 people dying of lung cancer in one year. Breast cancer claims about 40,000 lives a year. With those numbers, lung cancer deserves more than a lonely plastic box at a grocery checkout. The closest I’ll ever get to being a geisha. 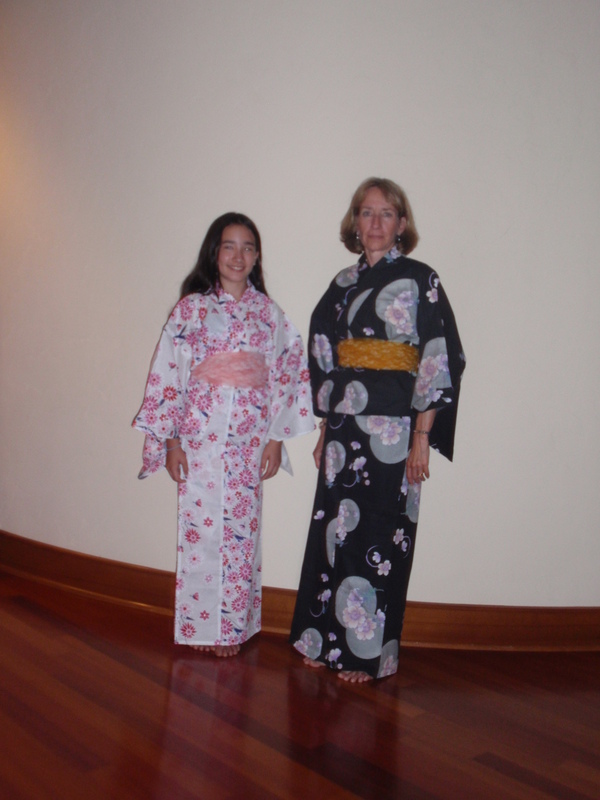 A friend in Japan brought these kimonos for my daughter and me in the summer of 2008. Technically, these are yukata, the lightweight kimonos intended for summer wear. My own version of 1920s motoring garb, taken before my hair came out. The pink warrior. All I need is a little war paint. If you’ve done a race or walk for the cure, you might recognize that scarf as the current signature of the Susan Komen Foundation (in partnership with the Ford Motor Company). My sister and nieces did such a race on my behalf last summer and passsed on the scarf to me. The closest I’ll ever get to being Jessica Simpson. 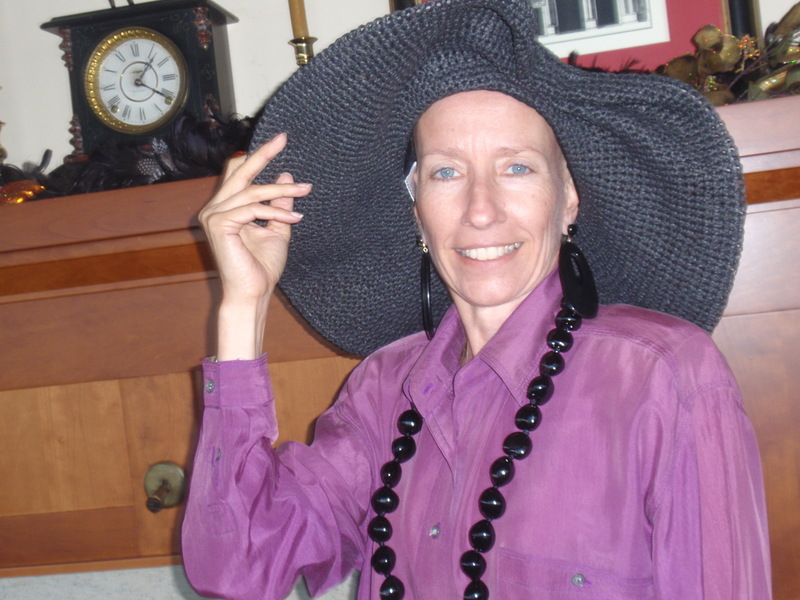 The hat, loaned to me by my mother, bears Jessica’s designer label. I’m waiting for the paparazzi to arrive. 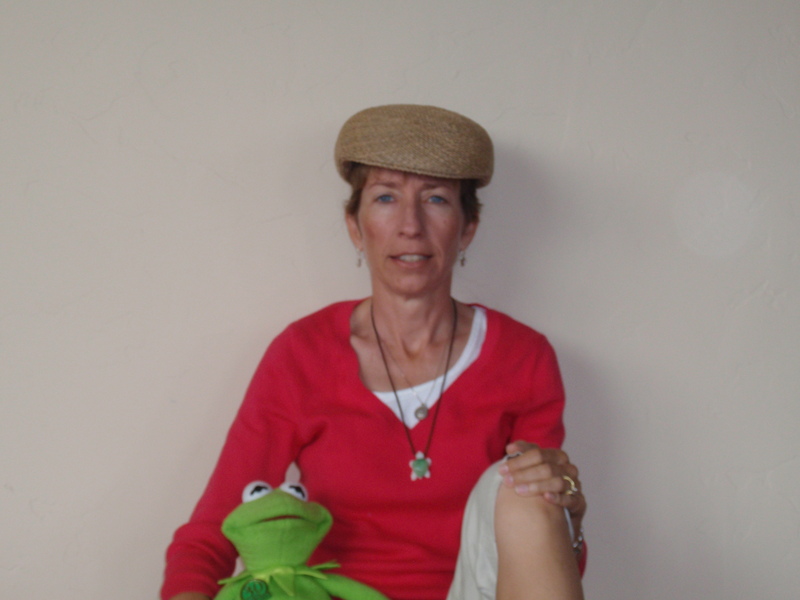 Many thanks to my photographers, my children, for indulging me in my experiments in identity.